Taylor and Turner shared the NLCS MVP award after Los Angeles beat the defending World Series champion Cubs in five games. Los Angeles Dodgers third baseman Justin Turner (right) celebrates with teammate Chris Taylor after hitting a two-run home run against the Houston Astros in the sixth inning in Game 1 of the 2017 World Series at Dodger Stadium in Los Angeles on October 24, 2017. T 'n T proved dynamite again for the Dodgers. 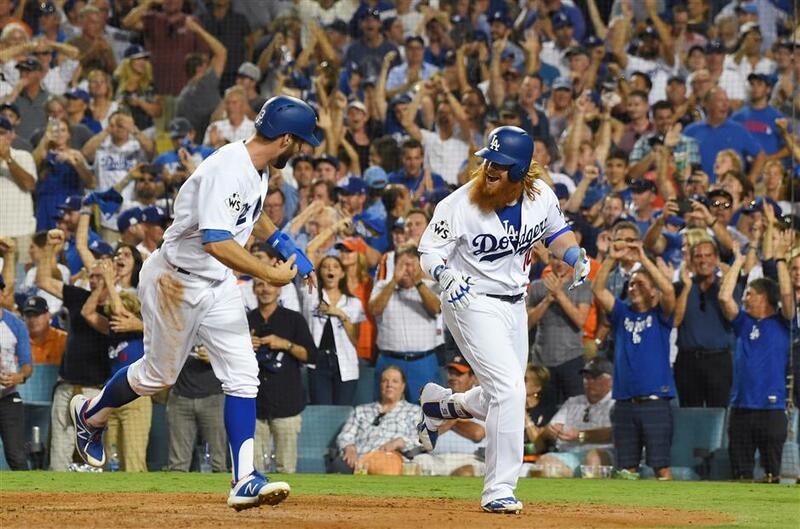 Chris Taylor and Justin Turner, co-MVPs of the National League Championship Series, produced all Los Angeles' runs on homers in the Dodgers' 3-1 victory over the Houston Astros in the World Series opener on Tuesday night. Taylor wasted no time leading off against Astros ace Dallas Keuchel, stroking an 88 mph fastball on Keuchel's first pitch into left field for a 1-0 lead. Turner followed suit, lofting a two-run shot in the sixth that put the Dodgers ahead 3-1. Taylor drew a two-out walk to set up Turner's blast. It was just the latest big October show from the Dodgers' robust reclamation projects. Taylor and Turner shared the NLCS MVP award after Los Angeles beat the defending World Series champion Cubs in five games. Taylor batted .316 (6 for 19) with two homers, and Turner hit .333 (6 for 18) while going deep twice, including the game-ending three-run homer to win Game 2. "I never could have predicted this," Taylor said. "The goal coming into this year was to hit for more power and get the ball in the air, but I didn't think it would be this drastic of an improvement." Taylor's path to baseball's biggest stage has mimicked Turner's — from the fringes to the spotlight with a swing overhaul. Turner was non-tendered by the Mets after the 2013 season before beginning to add loft to his cuts. He only signed with Los Angeles after then-bench coach Tim Wallach saw him and his revamped swing at a Cal State Fullerton alumni baseball game. Taylor made a similar adjustment early this year. Dodgers manager Dave Roberts said Taylor was considered a "fringy, 4-A player" with his old approach. His new one has helped put the US$240-million Dodgers three wins from their first title since 1988. Taylor became the fourth player in Game 1 history to homer leading off and first since Kansas City's Alcides Escobar legged out an inside-the-park homer against the Mets in 2015. "He's the spark plug," Turner said of Taylor. "He's been so much fun to hit behind and watching him become a star, really, on this team." Taylor has hit safely in seven of his nine postseason games, including three home runs. The 27-year-old center fielder joined the Dodgers in June 2016 after spending his first two years in the majors with Seattle. "He's matured a ton," Astros manager AJ Hinch said. "He's proven to be even more dangerous than obviously he was as a young player." Taylor has sparked the offense since he moved into the leadoff spot. "He's one of the guys who gets overlooked with all the superstars we have on this team," Roberts said. "But he's a big part of this." Turner went hitless in his first two at-bats against Keuchel, causing him to switch to a smaller bat. The move paid off when he floated a ball into the first row of seats in the sixth. "When the ball left the bat, I didn't think it was gone," Hinch said. "But there's no doubt he's pretty locked in, especially in big moments." The red-bearded slugger leads the team with four homers in the postseason, one shy of the club record set by Davey Lopes in 1978. He has reached base safely in all nine games in the postseason, and his 14 RBIs lead all players in the playoffs.